It has recently come to light that the Obama administration obstructed a criminal justice department money laundering/DEA investigation into Hezbollah (a terrorist organization) to ensure that the 2015 Iran nuclear deal moved forward. Obama’s deep-state operatives, the lifetime bureaucrats in the State Department, as well as those in intelligence and military circles, actively conspired to subvert the DEA and the FBI’s criminal investigations in order to move forward Obama’s Iran nuclear deal! What’s worse than this? The deep state and liberal left’s witch-hunt, spearheaded by a conflicted and biased Robert Mueller designed to impeach President Trump! Who needs facts or evidence when you have the support of the deep state and the very fake news media. The Resist-Everything-And-Do-Nothing Left will keep trying to impeach President Trump at any cost. They strive for social justice — deeming virtue signalling and identity politics the pathway to their utopian fantasy. If America wants answers to this fake Russian hysteria, Julian Assange has all the answers. He knows who gave the data to WikiLeaks, and it was NOT Russia. The real collusion is how the DOJ and the FBI under the Obama administration apparently colluded with the Clinton campaign to use the bogus Steele dossier to fraudulently deceive the United States Foreign Intelligence Surveillance Court in order to gain authorization to spy on and monitor the presidential campaign of Donald Trump. It appears that the Clinton campaign weaponized the NSA, the DOJ, and the FBI to spy on a political opposition party and then lied about it. What’s worse is that the FBI and DOJ view themselves as above the law while ignoring congressional subpoenas. And this isn’t the only scandal. One simply has to look at how the Clintons leveraged Hillary’s role as Secretary of State to funnel over $100 million into the Clinton Foundation, a pay-to-play cash-for-political-favours slush fund, so that Uranium One could purchase 20% of America’s uranium and export it overseas. Or how about Obama’s justice department covering up Hillary’s illegal email server and transmission of top secret emails? Donald Trump’s first year in the White House uncovered and identified politically partisan government operatives within the FBI and the DOJ as well as other bureaucratic lifers who are committed to staging a coup d’état designed to remove our democratically elected president. It seems that the USA has a massive corruption problem within the United States government. The conflicts, lies, perjury, and attempts to usurp the current government led by officials such as Robert Mueller, James Clapper, John Brennan, Rod Rosenstein, James Baker, James Comey, Andrew McCabe, Peter Strzok, Bruce G. Ohr, Nellie H. Ohr, Sally Yates and Andrew Weissmann are absolutely shocking. Why are taxpayers still paying the salaries of these government employees? Why are they still working for the FBI and the DOJ? Where is Attorney General Jeff Sessions on all this? The deep state and fake news Russian collusion narrative was a non-starter, so what’s the next coup d’état narrative? Sexual assault allegations? The IRS, the FBI, and the DOJ have been weaponized against democracy and America. It’s time for a purge. Will we get it? Highly unlikely. One would expect corruption like this in a banana republic. Sadly, it’s become America’s new normal politics—lie and deny. How this plays out: The Mueller witch-hunt team gets paid 10’s of millions in taxpayer dollars. 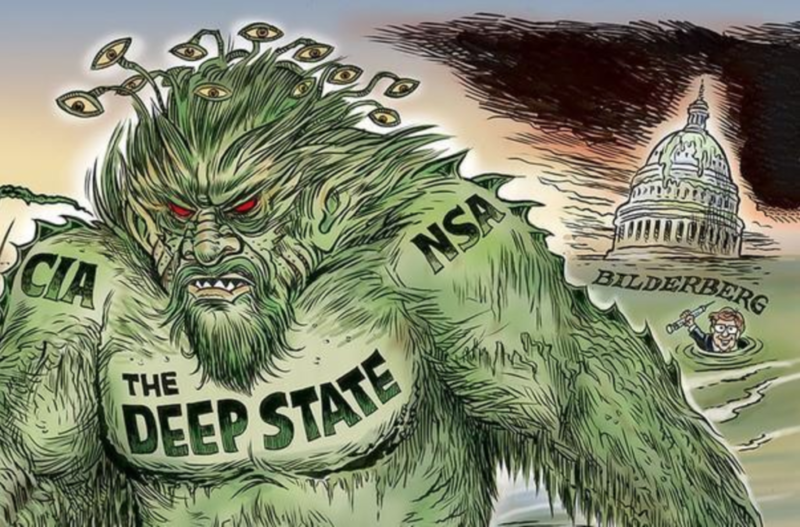 The deep state has engineered a Ponzi three-step strategy which destabilizes global finance: Pump, dump, and blame the entire collapse and next credit crisis entirely on Donald Trump. Prepare now. You have been warned. Image courtesy of Ben Garrison Graphics.